CMO job security is something of a running joke in the marketing world. It’s taken as a given that most CMO tenure is short—so short that calling it “tenure” might be a bit of a stretch. But good news is rolling in lately. 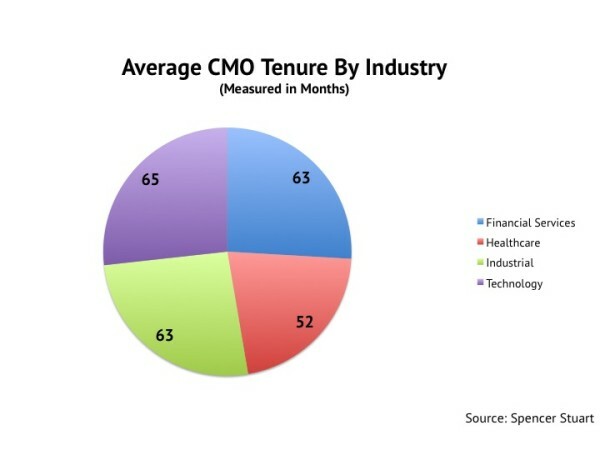 The average CMO tenure is on the rise. Spencer Stuart, which does an annual report on the subject, found that CMOs stay on the job on average for 48 months, a jump over the 45 months counted in 2013. But if you’re a B2B marketer, the news is even better. Isolating the more B2B industries—the four industries measured with longer sales cycles and higher considered purchases (Financial Services, Healthcare, Industrial and Technology)—shows that average CMO tenure is closer to 61 months. In fact, in each of those four industries, CMO tenure grew year over year, rising by as much as 23% in healthcare. According to Spencer Stuart’s own release, the ability to demonstrably measure the success of marketing programs is leading to longer term stability within this relatively new (the “CMO” hasn’t been around that long) position. In other words, the idea of data-driven CMOs is more than just talk. The ability to measure efforts and present them, much in the way leaders in sales and product have for years, is resulting in greater accountability and job security. This is obviously a terrific trend. But as CMOs earn more budget oversight, they need to look out for blind spots in their measurement programs. B2B spending on content is expected to rise by 74% this year. More CMOs are plugging dollars into content development and distribution in order to move buyers through channels, engaging them at every touchpoint in their journey. But for most attributing actual leads and revenue to content is overly difficult. Only 27% of B2B marketers are even tracking utilization metrics for content. Content is clearly the backbone of B2B marketing. But as CMOs in the industry grow in respect and accountability, they need to make sure they’re investing in programs and infrastructure to measure the actual return on that content. Otherwise we’ll be going back to making jokes about how long CMOs last.